The recent tragedy in the Gulf of Mexico has prompted me to think of a creative mode of expression to help us heal. The destruction of the waters and shores that are so close to my heart is akin to a death. We are all grieving and don't have a proper outlet for our grief. We may not even realize that we are grieving. We feel anger, frustration, confusion and loss. The loss is so far reaching that a singular ritual as a funeral or burial is not enough. This art piece will be one in which others can contribute. Allowing others to add to the piece can be an effective tool for expression of our loss. The process will involve many people and hopefully will spark conversations of hope and nurturing. The project will invite needleworkers, crochet and lacemakers from all over the world to contribute to the Antimacassar for The Gulf of Mexico. The word lace comes from the Latin laqueus meaning snare. The work will be a large stitched piece (approx. 36" x 96") to hang on a wall. It will be white lace, applique and embroidery on a tuille background to be hung on a dark blue wall. The imagery will be of stylized shells, dolphins, whales, birds, sea oats and starfish springing from a central fountain. The image will be mirrored on either side of the central fountain. The fountain represents the outpouring of feelings and the light that we send from the jewel in our hearts. An antimacassar (an ti muh KAS er) is a piece of cloth that is hung on the back of furniture to keep it clean. In the 1800s the antimacassar was used on the backs of chairs and sofas to to keep oil off the furniture. Macassar was a type of hair oil. These pieces were handmade of lace and crochet. This Antimacassar for The Gulf of Mexico is based on the Grandmother's Prayer (see below). The Antimacassar will be a metaphor for the net that connects us all to each other and to the earth. The Gulf of Mexico needs healing and cleaning. It is not something we can do with our hands. There are people who know what to physically do and they have to do that. The real healing and cleansing of the Gulf is energetic and it is light. We are being called to use the Net of Light. I am sharing this request that was shared with me. Please join us. Your focused attention is required and appreciated by all and the earth and all life on it. The Grandmother's Council of Indigenous Elders Worldwide have requested the rest of us join them in the following meditation. Their website link is below the request. We ask you to cast, anchor, and hold the Net of Light steady for the Gulf of Mexico . This crisis is affecting the entire world, and humanity is asleep. Wake up! Animals are dying, plants are dying, and your Mother is writhing in agony. If you hold the Net of Light steady at this time you will help stave off further catastrophe. You have been lulled into a false sleep, told that others (B.P.) will take care of this problem. This is not so. And this is not the time for you to fall into oblivion. Determine now to stay awake, and once you have made that commitment, think of, cast, and hold the Net of Light. Hold it deep and hold it wide. Amplify its reach to penetrate the waters of the Gulf and dive deep beneath the crust of Mother Earth. Anchor it at the earth's core and as you hold it there, ask it to unify with the mineral kingdom of this planet. It will do this and will harmonize with all the solid and liquid mineral states on earth-including oil and gas. The Net of Light will call these minerals back into harmony. Whatever human beings have damaged, human beings must correct. This is the law. We repeat: This is the law. You cannot sit back and ask God to fix the mess humanity has created. Each of you must throw your shoulders to the wheel and work. We are asking for your help. Several years ago we gave you the Net of Light so you would be able to help the earth at times like this. Step forward now. This is the Net of Light that will hold the earth during the times of change that are upon you. First move into your heart and call on us. We will meet you there. The Net of Light is lit by the jewel of your heart, so move into this lighted place within you and open to the Net of which you are a part. Bask in its calming presence. It holds you at the same time that you hold it. Now think of magnifying your union with us. We, the Great Council of the Grandmothers, are with you now, and all those who work with the Net of Light are also with you. There are thousands, even millions now connected in light. Along with this union, call forth the power of the sacred places on earth. These will amplify the potency of our joint effort. Then call on the sacred beings that have come to prevent the catastrophe that threatens to overwhelm your planet. We will work together. Think of, cast and magnify the presence of the Net of Light in the Gulf of Mexico . See, imagine or think of it holding the waters, holding the land, the plants, the sea life, and the people, holding them all! The Net of Light is holding them steady; it is returning them to balance. Let the love within your lighted heart keep pouring into the Net of Light and hold, hold, hold. Calmly and reverently watch as the light from your heart flows along the strands of the Net. It will follow your command and continuously move forth. As soon as you think of it, it will happen. We ask you to practice this for only a few minutes at a time, but to repeat it throughout the day and night. We promise that this work with the Net of Light will do untold good. We are calling you to service now. You are needed. Do not miss this opportunity. We thank you and bless you. Inlet Beach is so beautiful. I hope it stays this way. 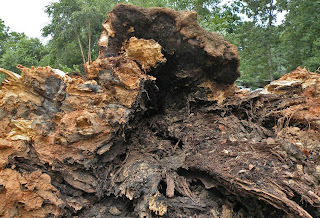 When a tree goes down it is usually quite a cataclysmic affair. Lightning, fire, even old age. This tree's heart has decayed. Its death starting from the inside. It lived a full life. 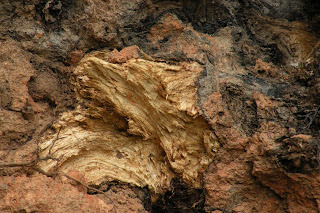 Many burls on its trunk. The sound of it coming down must have shook all around it. Today was the perfect day for me to find this treeheart on my walk. I have been reading a book about aging. Last night I read a passage that says most people close up their hearts because of fear. Fear of the magnitude of their feelings. Fear of the magnitude of their feelings. When I found this tree those words rang in me like a bell. Then it started to rain. Grant Park is such a beautiful place in the heart of our neighborhood. Lots of people come and have family picnics. This is a common sight on a Monday afternoon. I used to think this was a malicious act but after a conversation I had the other day I am rethinking it. I spoke with an employee at Home Depot who was talking to me about grills. He actually said that charcoal was biodegradable. The hairs on the back of my neck stood up. I told him about the petrochemicals in self-lighting charcoal. He honestly had no idea. So now when I see this in our park I know it is because people just are not informed. Lichens in the waning light of day. Remains of rampant ivy on the tree on the corner. Sunset walk, sunset colored hibiscus, marsh mallow. Crepe paper end of day crumpled flower. Recent trip with my friend and her two sons who are my godsons. Much unspoken about being a godmother. The spiritual path can only be glimpsed when the door is open. This trip helped us at least find where the door is. This seemed to be the most classic Old West photo of all I took. Even if it is shot at "High Noon." I loved the palette and the weathered patterns. Muted light in the shadows of big rock formations at Arches National Park. A rustic old log cabin from early settlers in the area that is now the National Park. Changing light on dried grasses. 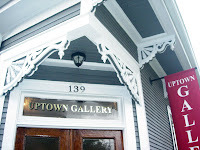 The opening at Uptown Gallery went well. 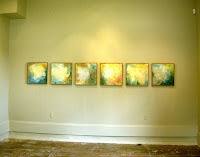 uptowngallerynola.com Everything flowed. The space is an old Victorian home converted to a gallery. Deedra and Dan and Renae in these photos with me. Thank you to you wonderful people who were there for me/with me. The show continues to November 14th. Many unforeseen things have happened in the last few weeks. Glad that there was a wedding to go to in between the funerals. Just tell the people that you love, how much you love them. Now.